Friday 1st December was a very special night for us here at Engage People. We are delighted to say that Engage People was named as The Best New Agency at the National Recruitment Foundation Awards 2017. It was all glitz and glamour on Friday night, as the NRF played host to the best and brightest from the recruitment industry. We are hugely grateful as a team for the opportunity to work with such a range of businesses across each of our core markets. We’d also like to extend our thanks to each and every candidate that entrusted their career to our team in 2017. The award comes at the end of what has been an exciting year at Engage People. 2017 has seen our team grow significantly, to 6 Recruiters, each of them hugely passionate about our Financial sectors. All are committed to maintaining Engage People’s outstanding level of service, to our clients and candidates alike. We couldn’t do this without our supportive extended team, encompassing Marketing, Finance, Training and Office Support. Each of our core areas across Accountancy, Banking & Financial Services and Insurance are in growth mode. We expect that momentum to continue into 2018. As a team, we are focused on both individual and collective growth. To that end, we have recently commenced our ‘Candidate Experience’ initiative. This involves requesting feedback from each candidate that we speak to about a job, to ensure that they feel suitably represented by our team. The feedback gained has been invaluable in enabling us to get better. To read more about the night, and to see a full list of winners, see the NRF’s own site here. As a team, we enjoy giving back. We give back to our candidates. Even before we are able to support candidates by presenting them with live roles, we offer frequent career, CV and interview coaching conversations to assist them in their search. Most of all, we are proud to support the Dublin Simon Community this Christmas. As part of what we’re doing to support others over the holiday season, we have provided 10 Home Starter Packages for families moving into their own homes. We are also proud supporters of the Simon House of Cards. Pictured above from right to left: Director Paul McClatchie, Cathal Kehoe (Marketing), Recruitment Consultants Sinead Canning, Simon Kennedy and Pat Brown. 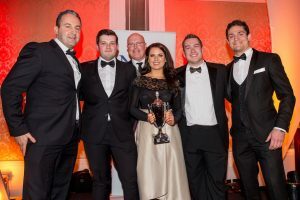 The award was presented to us by Conor Crowley of Acumen & Trust, sponsors of our award.